STUNNING EQUESTRIAN ESTATE PROPERTY DESIGNED WITH THE HORSE ENTHUSIAST IN MIND. RIDE 365 DAYS OF THE YEAR IN THE 92' x 140' HEATED, INDOOR ARENA. 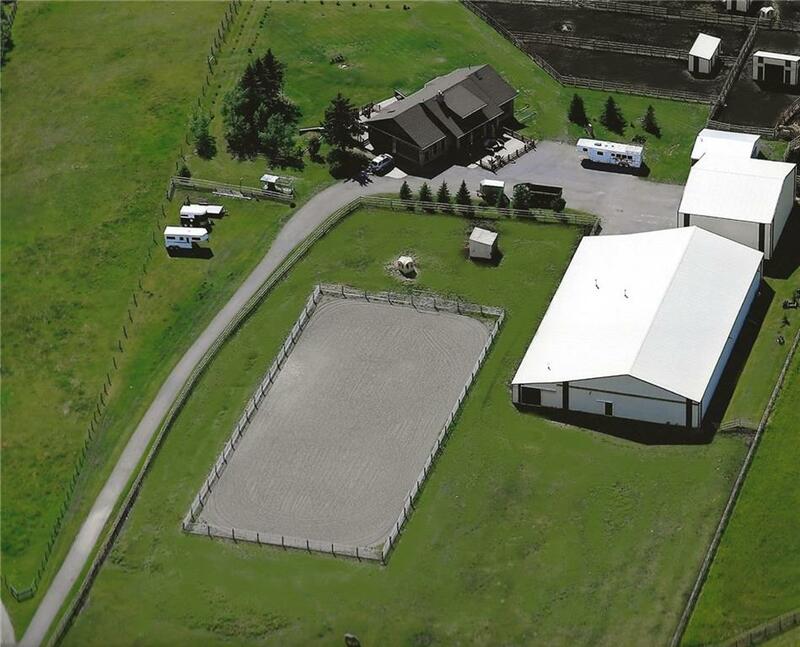 5 PADDOCKS & 3 SEPARATE PASTURES ALL WITH LARGE SHELTERS AND AUTO WATERERS. SPECTACULAR VALLEY VIEWS ONLY 1 HOUR FROM CALGARY! NEW SOLAR-POWERED SECURITY GATE. 360 DEGREE CAMERAS WITH MOTION DETECTION. Sun is shining? Move your riding enjoyment to the large 100’ x 240’ outdoor, sand riding ring. In addition to indoor/outdoor riding space, this impressive equestrian property boasts an attached tack-up area, 4 box stalls, a large heated shop and natural gas standby generator. Feed storage shouldn’t be a problem with the 48’ x 60’ hay/storage barn located on the property, and airplane hangar doors and 20' ceilings provide access for any larger equipment. The handcrafted, custom home is designed to highlight the spectacular view of the valley and is loaded with top-of-the-line extras.